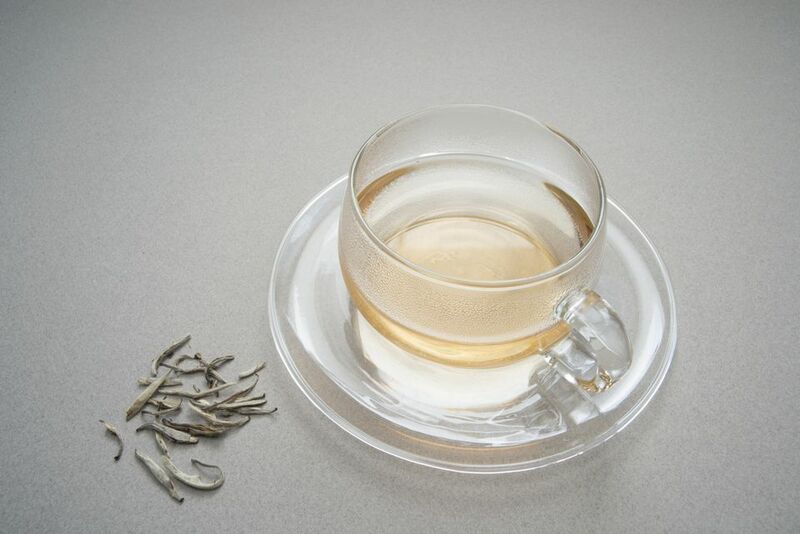 White tea is a type of tea with a fruity, delicate flavor. It is known for being high in antioxidants and low in caffeine. How does it compare to green and black tea? Why is white tea so expensive? Let's explore this delicate and rare tea so you can enjoy the perfect cup. Many people switch from black or green tea to white tea for health or taste reasons. If you're used to drinking green tea or black tea, you will find that white tea can be very different in its appearance, flavor, preparation, and price. Whereas most green and black teas are made from mature tea leaves, white tea is made either entirely or mostly from the buds (or immature, unopened tea leaves) of the tea plant. The buds should look white and fuzzy. This appearance is often referred to as looking downy because it resembles the appearance of fine down feathers. These hairs on the tea buds are a natural mechanism the white tea plant uses to protect its new tea buds from insects. Green tea is usually vegetal and either sweet or bittersweet. Black tea is usually bold, dark and fruity. White tea is very different from both of these tea types—it has a delicate, fruity taste. Some white teas are very floral, while others have notes of hay or milk chocolate. Flavored white teas are also available. These are commonly blended or flavored with fruit, flowers, and herbs (such as mint). Preparing white tea correctly is easier than making a good green tea, but slightly harder than steeping a good cup of black tea. Use water that is under 190 F and steep for three to five minutes. White tea is fairly flexible on its brewing times (some people steep it for as long as seven minutes). White tea's brewing temperature needs to be well below boiling. It is not as finicky as green tea and won't be ruined if the water temperature is a few degrees off. When you are buying white tea, you may also notice that it tends to be more expensive than many black teas and some green teas. This is because real white tea must be hand harvested from the tiny, young leaves of the tea plant. This process is very time-consuming and costly, so white tea is more expensive. White tea is also rarer than other teas, which creates more scarcity and drives up the price. White tea originated in Fujian, China, in the 1700s. It has been made in Fujian since then and was mostly consumed in China. Around the year 2000, a study came out about white tea varietals (specific types of tea plants). There are two white tea varietals, and they were shown to be low in caffeine and high in antioxidants. This study launched white tea into international popularity. It also encouraged tea producers in India, Sri Lanka, and other tea producing regions to start making white tea based on white tea processing. However, these white teas are made with different tea varietals, so they are not usually as high in antioxidants or as low in caffeine as white tea from Fujian. White tea is made from the buds and sometimes the leaves of the tea plant. It is often described as minimally processed and unoxidized. It is basically plucked and then withered (exposed to low-level warmth to reduce its water content) and dried (with sunlight or hot air). However, it is slightly oxidized during this process. It is also worth noting that, while the processing is minimal, it is not easy. White tea producers need to have a lot of skill to make great white tea. They also need to adapt to unpredictable weather conditions to harvest and process the tea at the optimal time. White tea is generally thought to be very low in caffeine. This is true for white tea from Fujian, China, because white tea from this region is from a tea plant that is naturally low in caffeine. However, white tea from other places is not necessarily low in caffeine. Some people refer to white tea as decaffeinated or caffeine-free, but this is incorrect. White tea naturally contains caffeine or, as some people (incorrectly) term it caffeinated. However, caffeinated actually means that caffeine was added. No caffeine was added to white tea because it occurs naturally. In fact, one tea and caffeine study showed that Indian white tea can be even higher in caffeine than Ceylon black tea. While white tea from Fujian may contain as little as 6 to 25 milligrams (mg) of caffeine per cup, other white teas may be closer to 60 mg per cup. Similarly, the claims that white tea is especially high in antioxidants relate to a study on white tea from Fujian, and may not apply to other types of white tea.